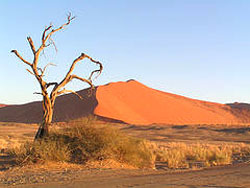 You may need some Namibia travel info when you decide to travel to this part of the African continent. It is such a beautiful country with so many scenic marvels that you will never be sorry for coming here. Here are some information to help you plan this adventure to the country with the highest sand dunes in the world! 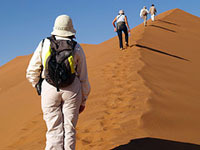 For any other Namibia travel info, you are most welcome to contact us via our Contact page. 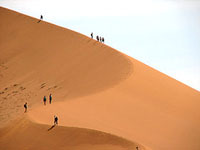 We recommend also Namibia Online Travel Guide as one of the best websites with Namibia Travel info. The National carrier of this country, Air Namibia, has regular direct flights from Frankfurt to Windhoek. South African Airways (in partnership with Delta), which is the national carrier of South Africa, offer daily service from New York JFK and Atlanta to Johannesburg and Cape Town. S.A.A., Comav and Air Namibia offer dialy (2 hour) flights from Cape Town and Johannesburg to Hosea Kutako International (Windhoek). The Hosea Kutako Airport is 40 km (25 miles) from the city Windhoek, the capital of Namibia. If you are coming to our ranch for an African Hunting safari , we will either pick you up at the airport (per vehicle) or organize your charter flight from the international airport. The choice is yours! We will organize this service for you according to your wish and as soon as you have made your booking to Uitspan Hunting Ranch. If you are interested in a holiday in Namibia, you may want to contact a professional for tips, advice and suggestions on your Namibian vacation. Here you may get the best prices on flight tickets. 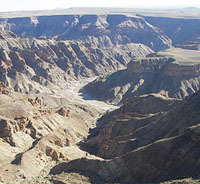 The planning and organizing of your Namibian adventure will be made easy! 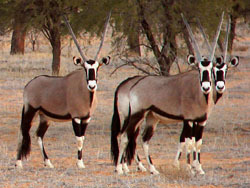 Read Nancy's comments on their travel-and-hunt trip to Namibia! 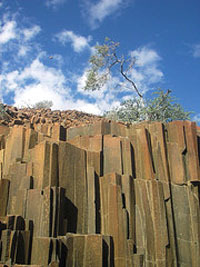 You may be overwhelmed by all the Namibia travel info and tourist destinations of Namibia. 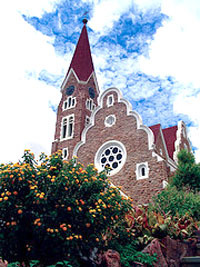 The capital city of Namibia, Windhoek, has a "continental" atmosphere. Its architecture, cuisine, culture, dress codes and educational institutions make it one of Namibia's main tourist attractions. 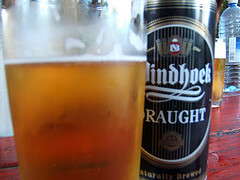 Windhoek's streets markets, its "Namibia Craft Centre", three historical castles and the wide variety of restaurants are definately my personal favourites to visit! It may be a good idea to buy yourself a good book with all the relevant Namibia travel info on the scenic marvels which this great country has to offer. 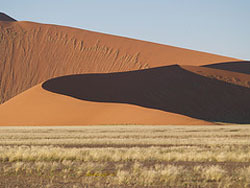 Choose one of the Namibia Travel books that we listed on a separate page for you. Each book is described in detail and quick ordering is made possible. Click here to find the best Namibia Travel Books. These books contains a lot of Namibia travel info and describe the tourist attractions of Namibia in detail. Ways of traveling in the country, how to get around, the best restaurants and where to stay... all in a nutshell. Since videos are such powerful ways of telling about something, we included this video of Namibia for you. This way you will see something of some of the great and beautiful places in our country. 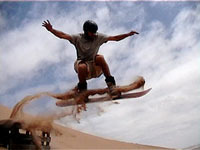 Enjoy... and "Welcome in Namibia!" Once you've planned your visit to the Kalahari of Namibia, you'll want to visit Africa again. For a completely different travel experience and climate, Cape Town is a good choice. Visit Alison's site for inside information on Cape Town travel tips! This list here will apply to both a touring and/or a hunting trip to Namibia . We hope that it will help you pack for your adventure to Africa! It is required by Namibian Law that your passport are valid for the period of six months from the date of your arrival in Namibia. Angola, Australia, Austria, Belguim, Botswana, Brazil, Canada, Cuba, France, Germany, Iceland, Ireland, Italy, Japan, Kenya, Lesotho, Lichtenstein, Luxembourg, Malawi, Malaysia, Mozambique, Netherlands, New Zealand, Portugal, Russia, Scandinavian countries, Singapore, South Africa, Spain, Swaziland, Switzerland, Tanzania, UK, USA, Zambia and Zimbabwe. Our Namibian Dollar exchanges at the same rate as the South African Rand (ZAR). Travelers' cheques and cashiers' cheques are no longer accepted by any of our banks. However, most businesses accept credit cards. US$ and Euro cash (except coins) are accepted at some places in Namibia. All the Namibian banks are open from 09h00 to 15h30 on weekdays and from 09h00 to 11h00 on Saturdays. Use this Currency Converter for conversion of your currency to Namibian Dollars. Namibia's medical system is modern and capable of attending to whatever needs you may have. We would recommend private hospitals for any medical care and emergencies. Other Namibia travel info you should have, is that the northern part of Namibia is in a malarial zone, so take standard malaria precautions when travelling in these areas. There are different strains of malaria and different habits of the mosquitos that carry it, so consult a doctor before leaving. 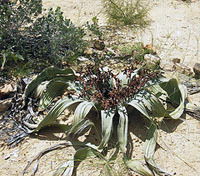 Malaria is not a threat however, in the Kalahari Desert region where Uitspan Hunting Ranch is located. We would like you to be in the best physical shape that your situation and condition will allow. Please inform us beforehand of any special requirements or specific medication you might need so that we can be prepared and plan accordingly. We are stocked with a comprehensive range of international brand name medication, but it is advised that you bring along the types of medication that you regularly take or may require. It is advisable to always ensure you have a comprehensive travel insurance policy which covers you for repatriation to your home country. 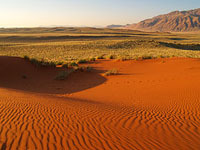 Read more about the the climate of the Kalahari. Although most places in Namibia offer clean, drinkable water from the taps, it is better to ask beforehand or use bottled water. The water at Uitspan Hunting Ranch is pumped from a borehole into sealed water tanks from where it is available for the camp and house. The quality, purity and taste of the water is excellent. Electric Power is 220V running at 50Hz. Have a look at the picture of the plugs used in Namibia. This will help you to pack the right converters! Official language(s): English (German and Afrikaans are widely spoken and in rural areas the local languages). Have a look at our famous video of the Common Pangolin in the Kalahari!